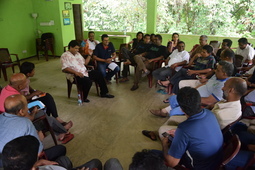 “Outbound Training Workshop for Government Chief Innovation Officers (CIOs), organized by ICTA was held in Bestlife Adventure Basecamp Kithulagala on 09th and 10th June 2016. This was a key venture which facilitated fifty CIO participants from different government organizations to gain a number of different experiences through outbound and capacity building activities. The outbound activities were a thrilling experience for the participants which consisted of ground games, ice breaker sessions, trust games which assisted in building confidence among participants and at the same time allowed participants to act as a team and also think and look differently at how they can work together. Apart from the adventure learning sessions this workshop provided a great opportunity to reassess the CIO strategic framework and also formed an open platform to discuss issues encountered by CIOs and this lead to a collaborative conversation with constructive responses from ICTA.